Rusty is one of the aforementioned intelligent robots, who on his way home from work one day finds a female robot with no legs lying in the street. She doesn't seem to talk, which is awkward, but he takes her back to his apartment, determined to find out where she belongs. Soon an unexpected and unlikely group have formed to fight an unseen, devious enemy. Rocket cars! Private rocket ships! Robots! Evil industrialists! And all that is before the world's tiniest giant robot shows up and starts wreaking havoc. 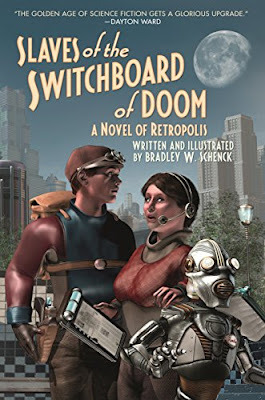 Schenck camptures this retro future perfectly. It's goofy, it's exciting, it's joyful. Don't go looking for science-fictional plausibility here; that would be missing the point. This is an adventure in the 1939 World's Fair's future, not ours, and it's a lot of fun. I received an advance reader's copy of this book, and am reviewing it voluntarily.